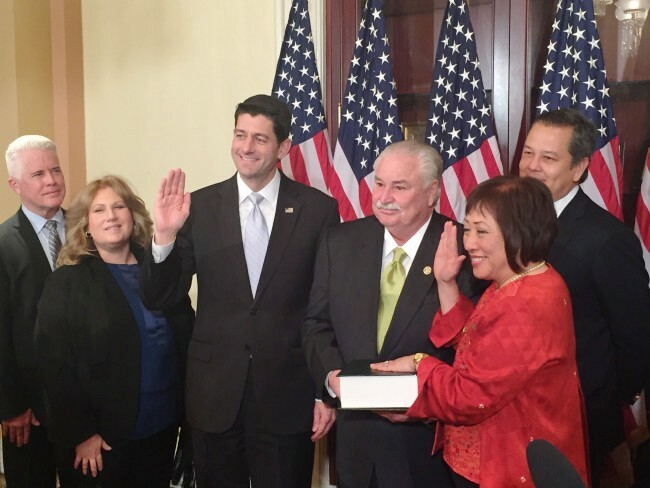 On Monday, Colleen Hanabusa was sworn in as a member of the 114th Congress by Speaker of the House Paul Ryan. Civil Beat. U.S. House swears in Hanabusa, 2 others. Associated Press. Colleen Hanabusa is officially a Congresswoman, again. Rep. Hanabusa was sworn in as a member of the 114th Congress by Speaker of the House Paul Ryan Monday evening. KHON2. Hawaii Hasn’t Been This Short On Congressional Clout In a While. Civil Beat. The state Department of Education has solicited air-conditioning bids for more than 800 classrooms under the governor’s ambitious goal of cooling 1,000 classrooms by year-end, but only about 40 classrooms so far have been cooled. Star-Advertiser. The U.S. Environmental Protection Agency is investigating Monsanto, Terminix and Wonder Farm for allegedly violating pesticide laws in Hawaii. Civil Beat. Hawaii’s largest public pension fund — the Employees’ Retirement System — had a healthy 4.5 percent gain in the July-September quarter which boosted its assets to an all-time high of $15 billion. Star-Advertiser. The state said Monday it expects to sign a contract this week for a marijuana tracking system required before Hawaii’s first dispensaries can open for business. Star-Advertiser. Hawaii is trying to bring in more tourists by taking advantage of surfing's elevation to Olympic sport status. Hawaii News Now. Mark Glick, administrator for the Hawaii State Energy Office, said Monday he is leaving his position to join the University of Hawaii’s renewable-energy research laboratory. Star-Advertiser. Mark Glick, who has headed the Hawaii Energy Office for half a decade, is leaving his top post next month to take a position at the Hawaii Natural Energy Institute of the University of Hawaii at Manoa, he confirmed to Pacific Business News Monday. Some $330,960 in federal funds will be used to house 35 homeless veterans next year in studio apartments inside a new veterans housing project being built in Kalaeloa. Star-Advertiser. Railings at other Oahu shopping centers to be inspected after deadly fall. KHON2. Hawaii County Council members will take to the roads — in a manner of speaking — when the council reallocates $804,512 in lapsed gas tax money that didn’t get spent in the allotted time. West Hawaii Today. Drivers hoping to have a construction-free Komohana Street will have to wait until next year. Tribune-Herald. The combatants in the Thirty Meter Telescope dispute are not only skirmishing at a state hearing in Hilo, but crossing swords at the state Supreme Court. Star-Advertiser. Hawaiian Telcom said Monday it has expanded the availability of its 1-gigabit-per-second high-speed internet service to homes in the Big Island’s Puu Lani Ranch subdivision and the surrounding Puuanahulu area using "fiber-to-the-premise" (FTTP) technology. Pacific Business News. NASA’s BASALT research crew is on Hawaii Island, conducting a simulated Mars mission at Hawaii Volcanoes National Park. Big Island Video News. USA Today names Chirashi Sushi Don by Jiro best restaurant in Hawaii. West Hawaii Today. With the demise of sugar, food makers that use only Hawaii ingredients are buying and stockpiling tons of sugar. Hawaii News Now. In a great big basin of thick, goopy molasses, a set of wheels slowly rotates, sinking into the pool of shiny liquid and emerging with a viscous, dark brown coating that slides off and flaps in the wind before dripping back into the basin. Maui News. A new monitoring system at Kilauea Point National Wildlife Refuge is now active and listening for Kauai’s creatures of the night. Garden Island. North Shore Shuttle pau. Service could return if funding is found. Garden Island.